Grab your galoshes and umbrellas - it's going to be a wet hump day. 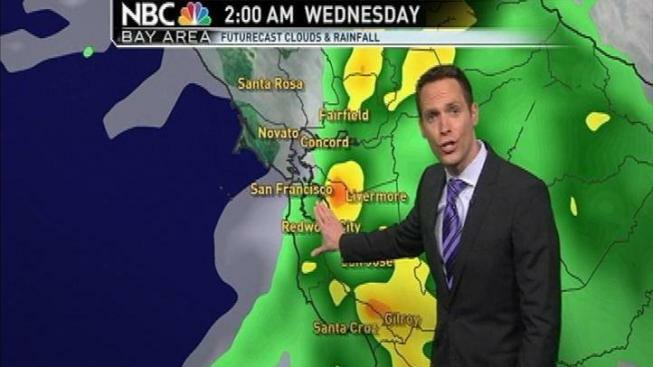 Monday's rain was just a taste of things on the horizon, according to the NBC Bay Area weather department. The first big storm of the fall season is bearing down on the Northern California coast as of Tuesday evening. Strong winds and heavy rain are expected to hit the entire Bay Area overnight and continue into the Wednesday morning commute. The rain is supposed to come down hard and fast which will make street flooding a possibility pretty much anywhere that might have clogged storm drains. The brunt of the rain is supposed to fall between and 1 a.m. and 6 a.m. with wind gusts up to 30 mph. A mid-morning clearing could turn to thunderstorms by the afternoon Wednesday. The same weather system is forecast to impact the Sierra. There is Winter Storm Warning in place for Tahoe. If you are headed up I-80 expect delays and possible chain requirements. NBC Bay Area Chief Meteorologist Jeff Ranieri said the summit could get a foot of snow. His forecast is 6-12 inches at 6,500 feet. Heavenly resort is watching the storm clouds in hopes the system is a sign of an early ski season. They sent the below photo of Lake Tahoe under ominous looking skies.